Most of our time is filled with either work or spending time with our kids so time is always of the essence. Preparing a low-calorie, quick and healthy lunch can be extremely easy if you have got the right recipes to follow. 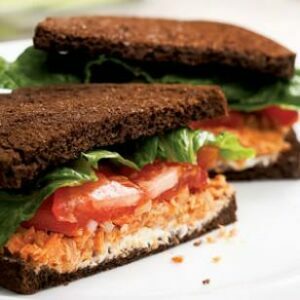 This Salmon Salad Sandwich recipe will help you achieve your weight loss goals without sacrificing nutrition. Salmon is packed with all the essential ‘healthy’ fatty-acids that can do wonders for your skin and overall health. Not only that, the pumpernickel bread that is used in this recipe is really good for reducing the calorie count of your post pregnancy diet plan. It’s very low in carbs as it is made out of rye, and it is also high in fibre. Pumpernickel is also loaded with lignans which helps to lower the risk of breast cancer. 400 grams of canned boneless, skinless wild Atlantic salmon, drained. 2 large leaves of romaine lettuce cut in half. Mix salmon, onion, lemon juice, oil and pepper in a bowl. Lightly spread small amounts of cream cheese on 4 slices of bread. Spread 1/2 a cup of the mixed salmon onto the bread slices with cream cheese. Place two tomatoes on each slice and a piece of lettuce. Complete the recipe by placing the slice of bread without the cream cheese over the prepared slices and you are done! That was really easy wasn’t it? This light, fresh and yummy sandwich will surely help you feel full and healthy. Say goodbye to unhealthy binges and get down to the post pregnancy weight that you are aiming for with this awesome recipe.